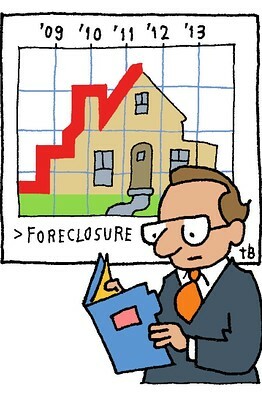 December 16th, 2010 7:25 PM by Lehel S.
Brace yourself for another rough year in housing: The number of foreclosures is expected by many to increase in 2011 as more troubled mortgages work their way through the pipeline. Next year could very well be a peak year for foreclosures, says Rick Sharga, a senior vice president at RealtyTrac, an online marketplace for foreclosure properties. The market is expected to tally about 1.2 million bank repossessions in 2010, up from 900,000 in 2009, he says. "We expect we will top both of those numbers in 2011." That's partially due to issues the industry has faced with foreclosure processing that began in the fall and delayed a portion of foreclosures from being completed this year, he says. In the so-called robosigning controversy, some lenders halted foreclosures after learning procedures for signing off on foreclosure documents might not be in accordance with the law. Continued high unemployment also is expected to exacerbate the foreclosure problem in the year ahead, as will upcoming interest-rate resets on adjustable-rate mortgages that will increase monthly payments for some homeowners, Mr. Sharga says. In the meantime, data on the volume of loan modifications from the Treasury Department indicate that fewer borrowers were being approved for permanent modifications in recent months, says Greg Hebner, chief executive of MOS Group, a loss-mitigation service provider to mortgage lenders and servicers. What's more, there's a growing feeling that modifying mortgages doesn't get to the heart of the housing crisis: "There is the perception that the answer to this involves trying to get job growth," which will help homeowners pay their loans and enable others to buy homes, said Jay Brinkmann, chief economist for the Mortgage Bankers Association, during a recent conference call with reporters. For the longer term, however, the outlook for the foreclosure market is better since fewer homeowners are becoming delinquent on their mortgage payments. Thirty-day delinquencies are down 11% since the height of the recession in the first part of 2009, according to Mr. Brinkmann. "It's good progress, but we are by no means out of the woods yet," says Steve Chaouki, group vice president in TransUnion's financial-services business unit. In a more normal market, 60-day delinquencies would be in the 1.5% to 2% range, he says. So how does all this bode for housing prices? High housing inventory, along with high unemployment, will likely add up to continued depressed home prices in the year ahead in many markets, says Nichole Jordan, banking and securities industry practice leader for Grant Thornton, an accounting and business advisory firm. "It's going to take several years to work through the excess inventory," she says. Ms. Jordan and others are looking to 2012 for anything resembling a recovery in housing. Even then, it's going to be a long journey to stabilization; it historically takes five to seven years for prices to stabilize after a deep correction, Ms. Jordan says. "Realistically, you're not going to see home prices appreciate next year," says Jason Kopcak, head of whole loans at financial-services firm Cantor Fitzgerald. In fact, many in the industry are expecting prices to fall another 10% next year on a national basis, he says. RealtyTrac's Mr. Sharga says the national decline could be around 5%. Other economists are expecting prices to remain flat. Next year "is going to be a wash, in terms of any meaningful recovery, and we're looking toward 2012," said Guy Cecala, publisher of Inside Mortgage Finance, during a conference call with reporters. And that's assuming there are no other major problems or delays to contend with, he says.